THE STORY - In the near future, due to a breakthrough scientific discovery by Dr. Thomas Harbor, there is now definitive proof of an afterlife. While countless people have chosen suicide to reset their existence, others try to decide what it all means. Among them is Dr. Harbor's son Will, who has arrived at his father's isolated compound with a mysterious young woman named Isla. There, they discover the strange acolytes who help Dr. Harbor with his experiments. A perpetual question humanity has been asking itself is; “What happens after we die?” Something that has been constantly eating away at us and practically defining our morality and decision making throughout life. Does being a good person guarantee you a good afterlife, or should you be a good person just because it’s the right thing to do? So many questions throughout life and so few answers. Each of us battles with our own demons and our own questions that will forever puzzle us. Charlie McDowell’s “The Discovery” attempts to answer these questions and while doing so, manages to deliver quite an intimate and poetic piece of modern cinema. After Thomas Harbor (Robert Redford) scientifically proves that there is a place the human mind travels after the body dies, humans across the world begin committing suicide by the thousands. Every one of them hoping to reach the “place” and see what glory lies on the other side. 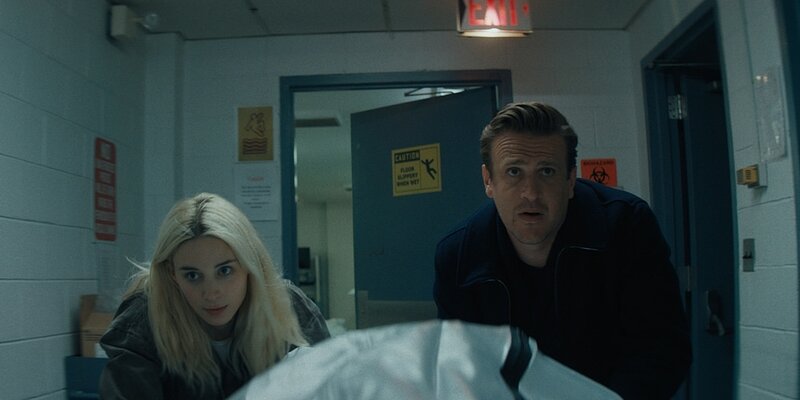 The film manifests itself into more and more research going into Thomas’ discovery through a visit from his son, Will (Jason Segel) and his recent rescuing of a woman who attempted to commit suicide, Isla (Rooney Mara). Thomas, Will, Isla and a few other supporting characters go through the motions of attempting to solidify even further proof that there is an afterlife and it’s a thing of beauty. With several different ethical questions being posed throughout, the film poetically weaves its way through intimate character interaction, a striking visual style, and powerful heartfelt performances. The screenplay that McDowell co-writes with frequent collaborator Justin Lader is poetic screenwriting at its finest. Screenplays that take on this specific form of dialogue and scenarios tend to bore or distract, but with “The Discovery” this manages to not be the case, with the characters speaking in poetic tongues, weaving their way in and out of each other's psyche. It reveals deeper and deeper themes, and intentions behind each major and supporting character. Not only does this call for and create a more intimate connection between the characters, but it also creates a more truthful connection with the audience. The film asks a lot of incredibly difficult and confusing questions. Questions about religion, faith, love, hope, and of course the afterlife. Films always have such an impending impact on our lives and this is even more so the case with films that tackle the hard to ask questions. Whether they divide audiences or bring them together, film is a way of forcing us to face these difficult and impending inquisitions and McDowell and Lader absolutely perfect this way of filmmaking. A few actions are taken to help prove this even further, one being its breathtaking visual style. The film is primarily shown in any and all shades of blue, highlighting the depressing and sorrowful themes that are discussed. Not only do the melancholic blues assist in delivering this, but also the use of a shallow focus. Almost showing how disconnected our characters actually are from reality, proving how truly focused they are on the afterlife. Another way these deeper meanings are received is through the performances. Redford gives his best performance in years. Mara continues to shine and steps into a well-deserved spotlight and Segel proves that he isn’t just a one-hit wonder. Jesse Plemons returns as another powerful supporting character, and Riley Keough is a shining star despite limited screentime. There are two things that this film sets in stone: One, Rooney Mara continuously delivers fantastic and complex performances who deserves much more attention as an actress. Two, that Jason Segel should continuously be sought out for dramatic roles. Rooney Mara is absolutely stunning in this complex role. Not only does she gloss over the poetic dialogue with grace and ease, but she delivers complex nuances that heighten her strengths as an actress. Playing an outcast on the brink of suicide who appears to be a basket case on the surface but is just as confused and curious as the rest of us. Rooney Mara perfectly submerges herself into this type of character and perfectly fits the role. Mara’s dialogue revolves more around the obscure and speaking in the poetic tongue I mentioned earlier. She hides her truth, attempting to throw any and all people who could care about her. She creates something mystical and supernatural with this performance that is unlike any other. Onto Jason Segel, now since "The End of the Tour" in 2015 he has been on a skyrocket upwards in terms of dramatic roles. After perfectly conquering his role as David Foster Wallace, he steps into a something darker and more profound. As the disappointed and skeptical son of an icon, he proves to be the “Maybe the truth is more satisfying than the idealistic” character. Countering Mara’s constant metaphors and challenges Segel settles into something a bit more realistic and bitter. In terms of character, this is an excellent study of how characters interact. From smaller scenes like Riley Keough betraying Robert Redford’s trust, and him banishing her from his team. To Jason Segel and Rooney Mara drifting among the aimless and sorrowful questions of afterlife and love. Turning from a pure science fiction drama film to a bit more of a mystical romance film, Segel and Mara handle this transition beautifully. Moving from simple scenes about the discovery and research into an afterlife into something that channels a bit of “Lost in Translation” kind of dialogue between Segel and Mara. The two confess past pain and tortures to one another attempting to find solace in each other. “You don’t have to do this alone anymore if you don’t want to” Segel expresses to Mara. Turning from just a hard to swallow pill about death and faith, to something deeper and meaningful about love, pain and past demons. Forcing us as an audience to connect our own painful life experiences with that of the characters, we slip down a thought provoking insightful rabbit hole that is something quite like a train wreck. It's an absolutely painful disaster that we cannot turn away from. "The Discovery" is a poetic heartfelt science fiction tale that attempts to answer all questions that we find too hard to ask. Showing us not only what we wish we did differently in our past, but how we must accept and confront the present. Perpetually bothering us about time, love, faith, and death, the film is a difficult and soft spoken viewing. Despite shoving specific ideals at us, the film still speaks softly about these ethical questions. Through a soft and glowing visual style and powerful complex performances, "The Discovery" delivers not only a science fiction element but also a romantic element. Provoking thoughts buried deep within our own psyche through the profound experiences of the characters, Charlie McDowell delivers a beautiful piece of modern cinema and of course another brilliant success for the original Netflix feature film market.